I have a deep love for Chia, if not possibly even an addiction! I love Chia jam, Chia bread, Chia in Oatmeal, Chia in green smoothies, Chia pudding and Chia in juice. I have never had a Chia Pet though. Unfortunately my Chia Pudding never really turns out like Pudding. It’s either too dense with seeds or too liquidy to be called a pudding. It’s still tasty though and I keep a batch to eat if I have a craving for sweets or to use in my new favorite Chia Fruit Bowl. This Chia Fruit Bowl somehow reminds me of that without trying to immitate it, and fail. It can be eaten cold, but I think it’s the heating up of it that makes it extra tasty. And bonus: it doesn’t take all day. This is super simple to make and you could probably figure it out yourself. But if you’re anything like me, you like to know the exact steps someone took to make something you want to try yourself. And then adjust it. 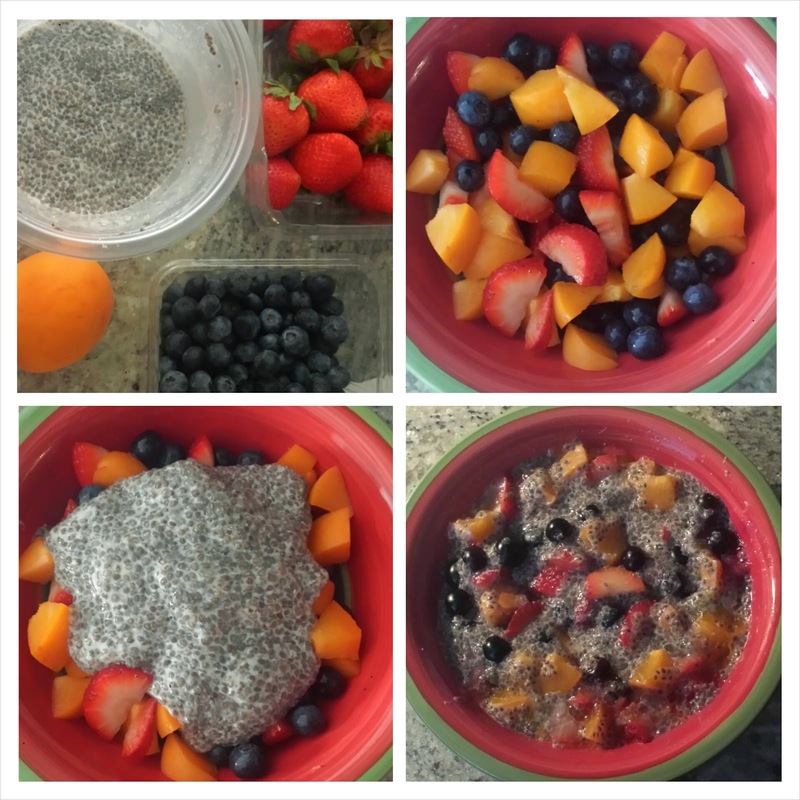 For best results you do need to have that Chia pudding concoction ready in your fridge and here is how I make it. Use organic whenever possible, or non-gmo-certified. Stir it all together in a storage container, stir, stir, stir, and place it in the refrigerator to thicken. I like to let it sit for at least 4 hours before I eat it or use it for anything else. Stir it again to break up some of the seeds that stuck together. Now it’s ready. For the fruit bowl all you need now is, you probably guessed it, fruit. My current favorites are Blueberries, Strawberries and Apricots. Top it with 4 Tablespoons of your Chia Pudding, mix and eat OR even yummier heat it up for a couple of minutes. I currently savor mine for breakfast, with the Pugs by my side, sitting outside and enjoying the morning. Simple joys! Of course you can top it off with more almond milk, add mint leaves, cinnamon, or for a dessert have it hot over some ice cream! This entry was posted in Food and tagged breakfast, clean eating, desert, vegan. Bookmark the permalink.